But if you look at the actual data coming out of Ohio, this thing isn’t even close. 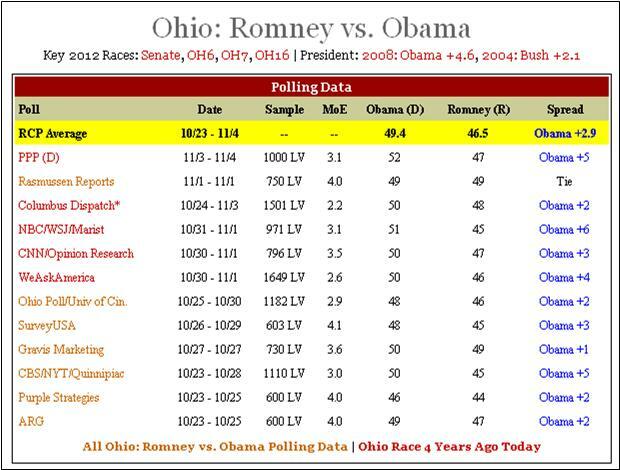 As Nick pointed out yesterday, Romney has completely erased Obama’s 2008 lead, just in the early voting numbers. The easiest takeaway from the polls thus far is what we’ve been saying for months: the sample of Democrats is seriously skewed. Some polls have Democrats turning out in the mid-40’s–something that has not happened in the modern electoral era. If you think the polls are correct in assuming such high Democrat turnout, just ask yourself: Are voters more enthusiastic today to vote for Obama than they were four years ago? But even assuming the only thing wrong with the polls, in aggregate, is the turnout model, the numbers spell disaster for President Obama. Using 2008’s historically high Democrat turnout, the President leads Romney by a 1.54% margin, with nearly 5% still undecided. And if you’re undecided today, you’re going Romney tomorrow. If President Obama hasn’t shown you in four years that he deserves another term, he isn’t going to convince you in the next 24 hours. What’s even more troublesome for the President is that only if Democrats turnout at their 2008 levels does he lead Romney. Even a one-point shift to Republicans gives the edge to the Romney, taking the race from 48.3% Obama, 46.7% Romney to 47.6% Romney, 47.5% Obama. But if Republicans turnout at their peak, we’ll be drinking champagne by 9:00 p.m. tomorrow. Romney has a +5% lead in that model. 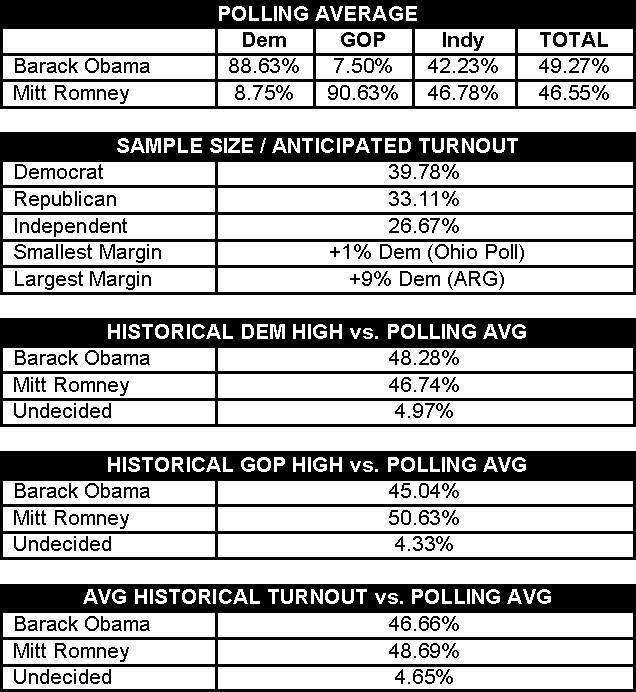 Yet, even at an average turnout for both parties, and still favoring Democrats overall, Romney maintains a 48.7% lead to Obama’s 46.7%. In other words, Obama’s only hope is for a repeat of 2008. And that’s not by my numbers, or one or two polls. That’s every poll combined. The Buckeye State is going Red tomorrow–or should we say Scarlet? But we cannot stress enough that now is not the time to take our foot off the pedal. We need to win this state and win it big–leave no room for post-election shenanigans from the left. The future of our great state, and this great nation, are in our hands tomorrow. Let’s bring home a victory for the good guys.